Do you know that you can recover a beautiful smile even in one day? The dental implant is a titanium screw which together with the crown, replaces the lost tooth in 100%. Thanks to the implants, the patient’s teeth look like their own. That is why a young patient came to the our clinic trying to find a solution for her problem which was that the upper three teeth did not grow up. Many years ago she lost the freedom to smile. Therefore, her problem was missing teeth. Thanks to the implantation of the dental implant, the patient regained the possibility of expressing unrestricted joy and comfortable functioning on a daily basis. An important aspect is the fact that the implantation performed by a qualified implantologist is a safe and predictable procedure. In the case of single missing teeth, the implantologist is able to perform the treatment even in just 15 minutes. In summary, the procedure is very fast and painless and does not involve limiting the patient’s previous activity. In the case when all teeth are missing, the implantologist can implant 4 implants and fix the prosthesis on them. Thanks to the use of a prosthesis on 4 implants, the patient regained the comfort she had long lost. She regained the ease of chewing and the joy of eating. In addition, the prosthesis on implants looks exactly like her real teeth. One treatment instead of many, without the use of scalpel. On one and only visit, the doctor removes the tooth which should be extracted and inserts the implant in its place. Thanks to this, both the removal of the tooth and its replenishment takes place in only one treatment, without the use of a scalpel. Also during the same visit, the implantologist completes the missing tooth by mounting it on the implant. You can arrange an implantology consultation at Dr. Zarański. Be Welcome! Why is the treatment of missing teeth with implants more and more common? Implantology has become a very important field of dentistry and has permanently entered the patients’ minds. It is a completely safe and quick method of reproducing the missing tooth. Do you have a question about your teeth? Do you want to make an appointment? +48 58 573 25 33 | Gdansk Wrzeszcz | 10. Konopnickiej Street. We invite you for an implantology consultation at doctor Tomasz Zarański. The highest quality and establishing a good and honest relationship with the patient is crucial for me in the implantology process. – says Dr. Tomasz Zarański. – That’s why 90% of my patients are patients on command. 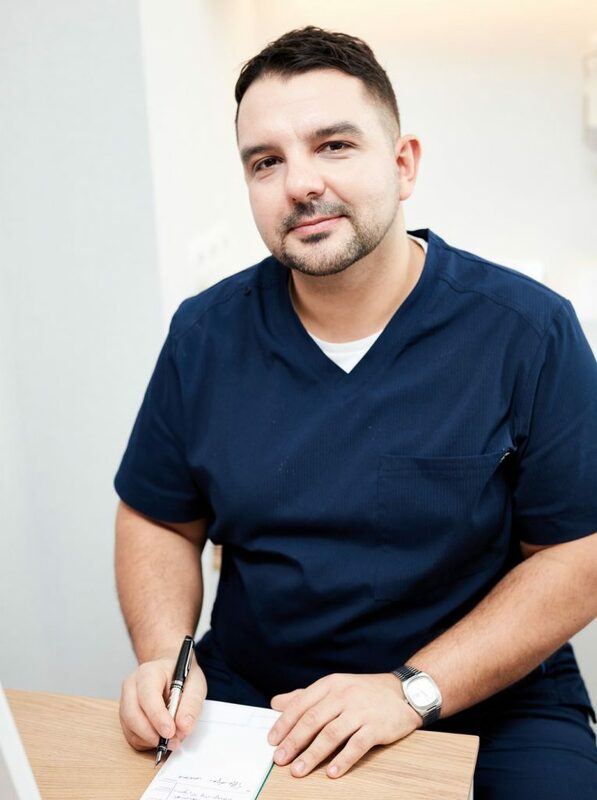 Tomasz Zarański is an implantologist with many years of experience. Expert in dental implantology International Congress from Oral Implantologists (ICOI) and Deutsche Gesellschaft fur Oral Implantologie (DGOI) and Polish Implant Association. Together we will see what is the best solution to help you.